When Dian Fossey went to live among the gorillas in a Rwanda forest in the 1960s, she brought a great deal of attention and concern to the fate of gorillas and the rain forests where they live. She feared for the survival of the species and for the rain forest itself. She was right to be fearful. In order for a forest to be considered a rain forest, either temperate or tropical, it must have certain characteristics. The first and most important is the annual precipitation amount. The moisture can be in the form of rain or snow, or even fog. As long as it receives at least 100 inches of rain a year. The second element that makes it a rain forest is the trees. There are a lot of them and they create a canopy that causes moisture to be retained, keeping the forest humid and wet. Tropical rain forests, like the kind gorillas live in, are warm, have broad-leaved trees and are teeming with flora and fauna. The rain forest comprises layers, each of which has a job to do to help the inhabitants survive. The emergent layer soars high above the rain forest and some trees reach heights of 200 feet or more. They sustain bats and birds of prey. The canopy is comprised of all the branches of the trees in the forest and many of the animals never leave the canopy. It provides shade for the animals below and helps trap moisture in, keeping humidity levels high. The understory is the area between the floor and the canopy. It is dark and wet, sustaining the lives of many insects who, in turn, provide food for other animals. The gorillas live on the bottom layer, the rain forest floor. They are very strong and surprisingly agile climbers for how massive they are, but only climb trees when escaping a threat or foraging for food. The two types of gorillas, the eastern and the western gorilla, both live in rain forests in parts of Africa, most notably in the Congo. The eastern gorilla lives at lower elevations, while the western gorilla prefers the mountains. 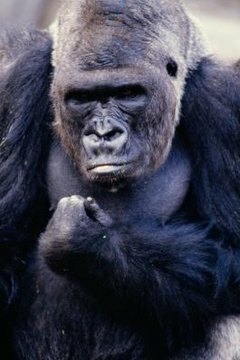 The eastern gorilla is less territorial and aggressive than his counterpart in the mountains, the western gorilla. Gorillas live in troops and interact with one another, grooming each other and eating the bugs they find on each other. Their diet comprises bamboo, bark, seeds, insects, flowers, berries and fruits. The western gorilla is slightly smaller, and in addition to the same diet as the eastern gorilla, eats seasonal fruits found in the trees of the forest. They both have been observed using twigs as tools to extract termites and ants from hiding places. They are up with the sunrise, foraging for food, then nap during the day, forage and interact some more, and then build nests on the ground with twigs, branches and leaves. They build new nests every night on the rain forest floor. The gorillas are endangered for many reasons. The rain forests are being cut down at a rate of 31 million areas the size of a football field every year, according to The Nature Conservancy. Logging, agriculture, mining and ranching are all threats to the rain forest. The gorilla is threatened because of illegal hunting. An average of two adult gorillas are killed every week to be sold at Congo markets for bushmeat. They are so severely threatened that there may only be about 200 left in the Congo, according to the BBC Earth News, who conducted an undercover investigation into the sale of bushmeat in 2009. Efforts are underway in Africa to help conserve the rain forests, but there are far too many poachers and those who engage in unsustainable ranching, mining, logging and agriculture for those efforts to make much progress. What Layer of the Amazon Rain Forest Do Boa Constrictors Live In?